IWM London’s Culture Under Attack season reveals how war threatens the treasures that make us human. Culture Under Attack is a free season of exhibitions, live music, performances and interventions that explore how war threatens not just people’s lives, but also the very things that help make lives worth living. Taking place at IWM London from 5 July 2019 to 5 January 2020, the season spans architecture, photography, art and music, revealing why some people try to eradicate or exploit culture, while others risk everything to protect, celebrate or rebuild that which defines us as human beings. Curated in partnership with Historic England, What Remains (5 July 2019-5 January 2020) explores why culture and heritage are attacked during war. The exhibition will highlight both historic and contemporary instances where buildings, places, art and artefacts have been deliberately targeted by people who wish to exploit or even erase whole civilizations from history, as well as examples of resistance, protection and restoration. 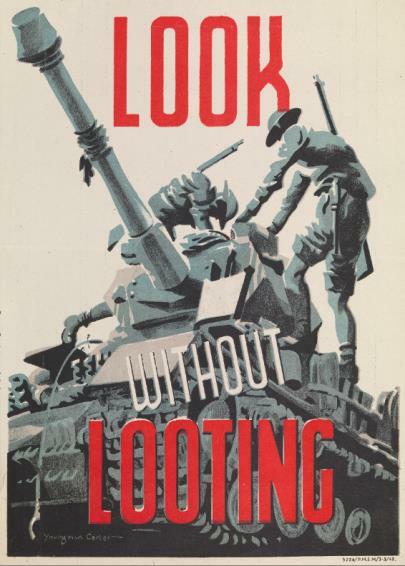 Taking IWM’s own story as its starting point, Art in Exile (5 July 2019-5 January 2020) uncovers how cultural treasures in British museums and galleries were evacuated and protected during World War II. Presenting that which was saved and referencing that which was not, the exhibition will examine the important wartime role of cultural organisations and the balance they struck between hiding, preserving and displaying collections. Just as buildings and artworks are threatened during conflict, so too is music. Rebel Sounds (5 July 2019-5 January 2020) is an immersive exhibition that reveals how groups and individuals used music to resist, rebel and speak out against war and oppression. Specifically drawing on examples from Nazi Germany in the 1930s, Northern Ireland in the 1970s, Serbia in the 1990s and present day Mali, the exhibition will explore the significance of music in relation to cultural and personal identity. Offering unique opportunities to see some of these extraordinary individuals in performance and in conversation, Rebel Sounds Live is a series of live interventions and discussions with those taking personal risks for the culture they love. Exploring stories from the genres of Syrian Death Metal and Serbian Techno to African Desert Blues, events will take place throughout the season, revealing the realities of performing at risk of serious punishment, arrest or death. Other examples of cultural resistance, including events with Stephen Coates of the X-Ray Audio Project, will reveal the story of Cold War Russian bootleggers who defied government bans on Western music by secretly etching forbidden music onto discarded X-rays called bone records. Discussions and live record-cutting demonstrations will take place both at IWM London (21 September 2019) and the World of Words Tent at WOMAD Festival (27 July 2019). The season will also present the third annual IWM Remembrance Lecture (6 November 2019), made in partnership with BBC Radio 3, bringing together artists, experts, eyewitnesses and the public to discuss cultural memory and its physical protection and preservation in conflict zones. Breaking the Silence (10 November 2019) will see IWM London taken over by a new performance exploring culture, identity and conflict, created by young artists in partnership with Serious, producers of live jazz, international and contemporary music. Admission to IWM London on Lambeth Road, London SE1 6HZ, is free. The museum is open daily from 10am to 6pm, closing 24-26 December.